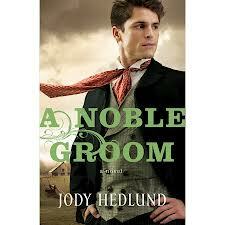 When I saw that Jody Hedlund had a new book out I checked to see if the library was going to be getting A Noble Groom and was thrilled to put it on hold before it ever came in. This is the second time now that I’ve been able to snag a copy of a newly released novel. Ah, bliss! Jody is well known for her ability to research an area and topic and create a story that reflects real life events. This is what makes her novels more than just historical romance. They are true historicals but romance is definitely in these pages. Let me say this, Ms. Hedlund writes well and honestly and she is going to take you emotionally into places you may not want to go before giving you a happy ending. In this novel, taking place in Michigan, highlights the struggles of German immigrants who are struggling to adapt to a life of farming after originally immigrating with the goal to take up their mining labors like they had in Saxony. Annalisa is an obedient daughter, married to a man of her father’s choosing. Hans isn’t brutal but neglectful and more interested in gambling away the farm than providing for his growing family. Annalisa ends up widowed, pregnant and the mother of a young daughter who is trying to keep the farm and hold off the attacks of a man who wants her property to build a lumber mill. Annalisa’s father sends a note to his brother in Germany, to see if a relative might be available to come and take over the reigns of Annalisa’s farm, and be her husband. When a man arrives on their doorstep months later, they assume it is the groom, but it’s not. Carl Richards is on the run from a death sentence in Germany, but if the people that have taken him in and provided him with food, shelter and hard labor like he has never known, were to discover his true identity, they would kill him first. Carl is in reality the only son of a Baron who oversees the mines where Annalisa’s family used to work, and where her brother died. A growing attraction develops and Carl is torn between his deception and love for Annalisa who still awaits her groom from the Old Country. When he finally arrives they will have difficult choices to make. A natural, historical tragedy, puts them all at risk. Will everyone survive the test? I enjoyed this story very much. It highlighted the trials and the marriages of the era, where love was not the point of marriage, but a partnership for survival. Jody highlights the idea that even then, love and kindness can flourish during dark and difficult times, when one is committed to God. A worthy read.